Connor MacLeod, transforms into a young man once again, but has the youth been sucked out of this film years later? In 2024 the world has moved on with a force field protecting the world from global warming and putting the Earth into darkness. MacLeod has a surprise when more of his kind tries to kill him, leading him to confront an old enemy about the secrets behind the force field. Highlander cleverly uses the immortal aspect of its main character to reinvigorate the film series to show a future world. The franchise has now turned more openly into a science fiction fest, with futuristic technology, a purple sky, a grimy 2024 world of criminals, and a run down polluted city. This all helps create a more suitable atmosphere for the moody MacLeod and his immortal quest. The action scenes are invigorated by the future setting too, with hover boards, laser pistols and winged henchman all helping create exciting moments. The MacLeod himself is more impressive in these scenes with sword fight choreography becoming bigger and better, especially in the final sequence. This film even offers a villain with character traits; he’s got a psychotic personality and his position as leader the MacLeod’s home planet gives the narrative and the lead character more drive to defy him. Having said that the story itself is very similar to the first film but this is helped by a quest to uncover problems with the force field, protecting Earth with both this and the villain conveniently but successfully looping in together towards the end to make for a more engaging finale. One downside is Louise Marcus, who starts off breaking into the Shield Corporation as a terrorist and is introduced on TV as essentially a criminal. Soon enough however she quickly falls doe-eyed in love with MacLeod, wearing dresses and looking cute for the camera. She handles a gun well towards the end but it’s disappointing they had to pacify her strength instead of enabling her to become a valued part of the Highlander posse. We already had Sean Connery as the second key player after Christopher Lambert’s MacLeod and he makes a surprising return here, adding much humour and gravitas to a role that is admittedly silly but fun. 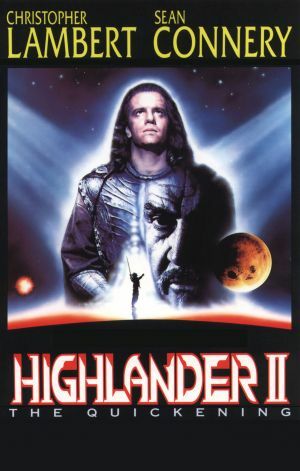 If Highlander II has been renowned for anything, it’s for being one of the worst films ever made and after such a good review you might be wondering why that is. The main source of this stems from this film's absolute departure from the originals core story: the immortals aren’t from Earth anymore and MacLeod and Ramirez's friendship begins in different locations and times. These major changes could be seen as discrediting the franchise, but purely for entertainment purposes this film holds better pace, more impressive action scenes and has a more intriguing main storyline. It may not be revolutionary but it’s a fun ride while it’s on.